Bloom County was an extraordinary comic strip during its storied, hilarious, multi-year run. If I were to list the most important influences on my sense of humour and language, right after Walt Kelly’s Pogo would come Bloom County, which had a similarly sprawling anthropomorphic cast, political bent, and a strong sense of word play — centering particularly on the way words simply sounded. Despite two revivals in the Sunday funnies, some animated specials, a couple painted gift books, a line of greeting cards, and an iced tea flavor, Bloom County has not successfully established itself as a fixed, indelible part of day-to-day pop culture. The fact that it continues to be referenced and resurrected in one minor way or another is testament to its cult belovedness, but that it’s not a referential throughline, not a cultural touchstone is frankly beyond my reckoning. A woman approximately my age just confessed on a public social networking board (gasp!) that she’d never heard about the whole Michael Jackson Pepsi commercial where his hair caught on fire. My first reaction was to be startled, until I realized that my knowledge of it came not from the event itself, not from the incident, but from the cultural commentary that followed. Specifically, I remembered the way in which it was satirized in Bloom County. A brief internet search produced similar memories on various people’s blogs, but no reproductions or scans of the strips themselves. Just a brief couple notes to wrap up the Fun Home experience. I waited a while to read the book because I wanted Ms. Bechdel’s live presentation of the material to stay with me as long and as clearly as possible. It was a performance, in the classic theatrical connotation of the word, and despite the fact that she performed the same slide show and the same narration at bookstores and colleges around the country, it was a live reading that had its own foibles and tremors and delicacies. And it was an affecting experience. And I knew that when I read the book on my own, the stillness and the solidity of the images in my hand would quickly begin to overwrite my memories of momentary experience of having the graphic novel read to me. Just as my memories of watching Suzanne Cryer as Tracy Lord have been blurred and conflated with repeated viewings of Katherine Hepburn as just as the mystic glory of hearing Natalie Merchant perform “Verdi Cries” as a duet with piano and violin has almost totally been supplanted by the oft-spun recording, I know that my memories of the event will soon be overwhelmed by my re-reading of the graphic memoir. And so I tried to solidify and preserve the live memories of Ms. Bechdel’s reading before I read the book for myself. Time will tell whether that will be successful. It’s an interesting read. Meticulously structural in places and with an elevated literary scaffolding, the essential technique of the interwoven visual and captioned narratives works well throughout the book. There’s a scrapbook quality to many of the reminiscences that provides a particular blank honesty to the storytelling and which helps offset (and highlight) the acknowledged distance that creeps into the narrative voice. A stupendous vocabulary and the regular occurrence of introspective, borderline epistemological queries occasionally make the narrative musings feel as if they could fly off into abstraction, and the connection to the curious domesticities over which they hang seems as if it could snap. The book never spirals off on such a zephyr, and the juggling of tone, perspective, and timeline make the overall work feel like quite an accomplished act of dexterity… but not, overall, an effortlessly masterful one. Affecting and effective, but not yet with the fine grace that belies the effort that went into it. But that’s only in terms of the overarching written structure of the work; visually, it is indeed a meisterwerk that is deceptively simple and elegantly complex. And that is almost certainly due to the meticulous prep and reference that Ms. Bechdel used in order to capture a natural, casual line in the figure work, particularly, but also in the scenery and layouts. However, to be ridiculous for a moment, I must say that one of my favourite parts of the volume is the dust jacket. 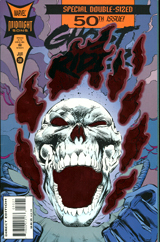 During the early nineteen nineties, comic books were plagued with an overabundance of gimmickry in their selling points, and a frequent offering were covers that were die-cut (like a classic V.C. Andrews paperback) or embossed with a metallic or fluorescent inks, foils, holograms, and prismatic papers to give the cover image that extra glimmer of collectible value. Fun Home is, in concept, scope, and execution, about as far from Ghost Rider #50 as it is from an eggplant, but the covers for both have shiny foil paper and die-cut hollows revealing pieces of the sub-cover beneath. 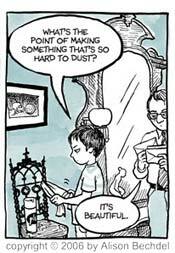 Many people have looked askance at the current resurgence in ’90s-esque marketing techniques in the world of superhero comics, but I don’t think that anyone would have guessed that Alison Bechdel would have presaged a parallel collector’s movement within the autobiographical and literary graphic novel community. Every so often, life conspires. How often have you gotten a summary of posts to a listserv that seem wholly irrelevant? For those of us who subscribe to listservs, the answer is “daily”. So it’s especially joyous when those collections of announcements and updates and queries and classifieds actually contain something of note. Case in point: despite the fact that I have well and truly graduated from Simmons College, I still receive daily updates on the parking construction, upcoming campus events, and job opportunities in Boston. Now, considering that I don’t live in or around Boston, these announcements are less than useful, and have been for two years now. And the fact that I didn’t unsubscribe from this list the moment after I’d joined the alumni association would be an utter mystery, if the universe hadn’t rewarded me for my patience. Because midway through last week, the was an announcement that comic-strip artist Alison Bechdel would be giving a lecture on campus. A quick glance at her website indicated that she would also be heading westward for a stop in Northampton, thus making herself available to the twin poles of the Massachusetts women’s college communities. Northampton used to be home to the Words and Pictures Museum, as well as other brainchilds of Kevin Eastman and Denis Kitchen, and has therefore been the New England seat of a thriving comics community (which may have moved north up Interstate-91 these days), but aside from the occasional hosting of a 24-hour comics event, it hasn’t been the most happening comics or “comix” spot in the recent past. So it was nice to hear that Ms. Bechdel was choosing to stop there on her promotional tour for her new graphic novel, Fun Home. It also gave me the opportunity to do something that I don’t do very often: be exposed to something about which I know nothing. I am very review conscious. I don’t always allow myself to be influenced by critical response, but I read trade magazines and hype magazines and reviews and large swathes of the internet, and so it is seldom that I come across a film or a comic that I know absolutely nothing about. I have usually encountered early gossip or a plot summary, or I know something about the directors, actors, or creators. I have some degree of context and familiarity. However, I had never read anything by Ms. Bechdel. I’d heard of Dykes to Watch Out For, but never encountered it, and therefore had no previous exposure to its content as comic material, as fiction, or as artwork. And because I am conscious of the fact that I am very review conscious, I occasionally try to make sure that I read or watch something about which I possess no pre-knowledge. It’s harder than it sounds, and the fact that I even recognized Ms. Bechdel’s name could be construed as a bit of a cheat, or at least of compromise. However, I was once again glad of the vicissitudes of circumstance. I’m not sure I would have been so impressed with the artwork or the multimedia presentation that was the heart of Ms. Bechdel’s appearance had I been familiar with her earlier work. As it was, I found the linework, the compositions, the color, and the overall technique to be marvelous and moving. The fact that she blew up each panel to be projected upon a screen allowed for one to see with considerable clarity the intricacies of the artwork. Also fascinating was the presentation itself. 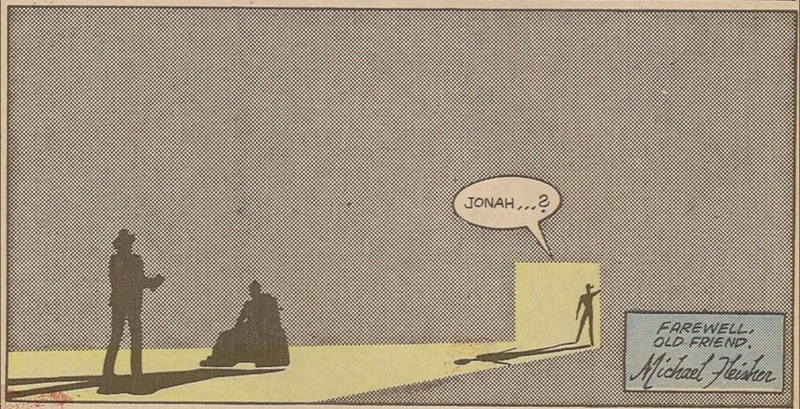 Comic books, as a medium, are perhaps singly effective at being able to present to the reader two parallel and interactive narratives simultaneously. The words, usually in captions, can tell one story while the images tell another. The intersections and echoes between these two narratives is often what demonstrates the most clever and evocative comics work — pristine examples can be found in Alan Moore and Dave Gibbons’ Watchmen, for example. 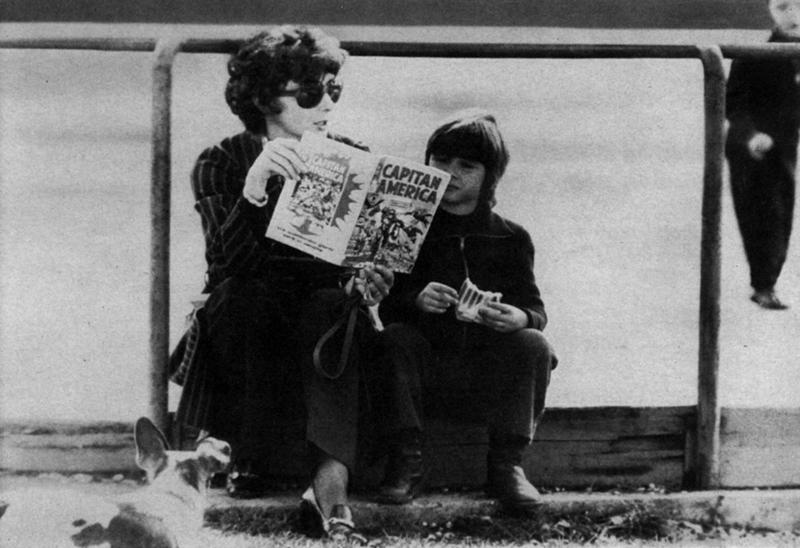 Bechdel read the captions from her narrative in tempo with the pictures, and allowed the audience to “read” the images on the screen. This was an extremely effective way of recreating the experience of actually reading the book. Comics are difficult to give live readings of, as the interplay of caption, dialogue, image, and voice don’t create the flow that reading from prose can have. And Bechdel’s presentation would not work for every graphic novel… But it was astonishingly effective for her parallel narratives. For those interested in her creative process, Ms. Bechdel gave a brief presentation in between the two chapters she read from in order to give a visual demonstration of her artistic process. She had given a similar demonstration in a streaming YouTube video, detailing the sort of modeling she does in order to capture body language so effectively. While this video doesn’t demonstrate the second half of her interlude — the transformative process of layering in lineart, word balloons, and an ink wash — it still gives an interesting view into her particular artistic endeavors. Many, many, manymany people have written about the recent New York ComicCon. They were, mostly, people who were in attendance, and therefore had something interesting to say. I wasn’t, so I’ve waited for the furor to die down somewhat before I felt it was safe to comment upon something that I really don’t have much experience in. That and, well, I had already blogged this week, and I find it hard to break the habit of storing up entires for those long, cold stretches when one really doesn’t have much to add to the global commentary. Publisher’s Weekly does a — shock! — weekly newsletter about the comic book scene, and they covered a conference of librarians at the NYCC to discuss the issues surrounding coded and overt depiction of sexuality in manga. Manga is hot in bookstores these days, and so it’s also hot in libraries. And because it’s hot. many publishers have jumped on the bandwagon and purchased the U.S. reprint rights to all sorts of speed-lined, zip-a-tone garbage that is well and truly thought of as ephemeral if not disposable in its country of origin. And librarians, despite the fact that they claim to be experts in evaluating sources and resources, are apparently all higglety-pigglety about being able to distinguish which manga is actually worth reading, and which manga might cause the average parent to transform into a short, stumpy, superdeformed caricature of steaming wrath. So, the article says, librarians would like ratings on manga. They acknowledge that some manga is rated already, but what they’d really prefer are the kind of ratings that the MPAA has been supplying recently — the kind where the reader is also provided with a laundry list of all the purile reasons why someone might want to go see this particular flick. (I’m being snide, of course, but mostly about the MPAA.) Certain librarians at this panel did feel like the ratings were insufficient in allowing them to anticipate content. And one interesting and accurate point was that even initial readings may not be an accurate gague of future content: “A manga series will start out clean and age-appropriate and later in the series will develop more mature themes.” Of course, due to the delay between domestic publication and U.S. publication, it shouldn’t be too difficult to see if a particular series has turned blue in Japan before volume one is printer over here. But that’s not really the key point of why I bring up this whole sundry tale. Librarians aren’t supposed to want ratings. According to the American Library Association’s Library Bill of Rights, “Materials should not be proscribed or removed because of partisan or doctrinal disapproval.” This has, in fact, been specifically interpreted to indicate that it would be unethical for a librarian to not stock or to deny the circulation of Rated-R films to youth. “Policies that set minimum age limits for access to any nonprint materials or information technology, with or without parental permission, abridge library use for minors.” Whoops. Guess you weren’t supposed to ask for that. No wonder the PW article described her as “hesitant”. BURN THE HERETIC! BUUUURRRNNN HEEEERRRRR!!! Of course, the real reason why this pinged my radar is because I think that particular proscription of the Library Bill of Rights is the best self-defeating statement since “All generalizations are false”. If the ALA make a dogmatic statement of doctrine stating that libraries aren’t allowed to follow dogma or doctrine, then they are obligated not to select or proscribe materials based upon the Library Bill of Rights. Whoops, again.